This topical guide on playing with babies, toddlers, and two-year-olds will introduce you to important books, videos, and information resources available from the EI Clearinghouse. This book is for the father who thinks he is short on time. It provides ideas to use to connect with their child/ children in ways that engages both parties, and ways to interact and learn from one another as they participate in tools built on promoting communication and activity. Widerstrom suggests creative ways to combine individual learning goals with play activities. Guidelines for involving children with disabilities are included. This incorporates theory and research-backed activities in a fun and engaging way. It will help caregivers help infants or toddlers nurture his/her skills and reach emerging milestones. Beckerleg describes activities that children find fun while they are improving their sensory awareness, coordination, communication, and social skills. This practical guide includes suggestions for using different types of equipment. Loose parts capture children’s curiosity, give free reign to their imagination, and encourage creativity. This form of play allows infants to be in control and recognize the power of their bodies and actions. This book lists titles of children’s books related to such developmental assets as positive identity and social competence. 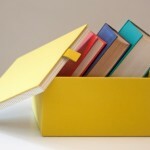 For each title Benson suggests ways for the adult to introduce the book and activities related to it. This book includes more than 100 fun, age-appropriate, “old-school” activities that promote the development of language, motor and social skills. The book includes detailed instructions for developmentally stimulating toys that parents and toddlers can make together out of everyday household items. Sluss reviews research about how play benefits a young child’s social/emotional, cognitive, and physical development. She includes recommendations for facilitating play with special needs children throughout the text as well as in a special section. Blake suggests simple creative arts and crafts projects children and parents can do together as a way of stimulating creativity and family relationships. This book provides activities that will help you support curiosity, play, exploration, persistence, emerging foundations in literacy and math, problem solving, and so much more! Schwartz has children with special needs in mind as she suggests ways parents can use suggested toys to encourage communication skills. The book includes chapters specific to the child’s age. 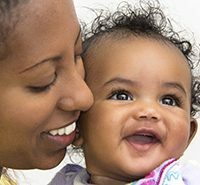 Parents and caregivers will learn how to play with babies in ways that support their social, language, and motor development. This video guides parents and caregivers in nurturing child development by offering novel opportunities play and learning. This video helps parents and caregivers create the best possible environment in which to maximize a baby’s learning potential. This DVD includes rhymes and songs and suggestions for parents to use these and books to interact with their babies. Early Learning – Play – These resources help caregivers to understand that play is how children learn to communicate, problem solve, test ideas, and get along with others. This site, provided by KidsHealth.org, provides information on toys, games, reading readiness, music, and activities for young children. 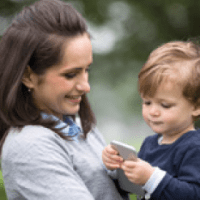 Dealing with Toddlers – helping caregivers understand toddlers and their development. Teachers can support play and learning by selecting appropriate toys. The author suggests inexpensive toys and materials that stimulated play and development. Through play children can learn about force, motion, diversity, and matter. Teachers can support this learning through their planning and interactions with the children. The authors describe the ways a family child care provider worked with children ages 18 months to 3 years to connect play and science. Games help make movement fun. Play and laughter can help develop friendship while encouraging physical fitness. Consider each child’s abilities, and encourage all children to play by adapting games for children with special needs. Also in Spanish and Polish. How Does a Blind Child Play? Parents can provide interesting situations and objects to encourage a blind baby’s exploration and play. This site offers information on curriculum, learning environments, brain development and screening, assessment, evaluation and observation of infants and toddlers. Teachers know the many ways children benefit from outdoor play. But when should the weather keep them indoors? Consider the health of the children, the severity of the weather, and the air quality. Also available in Spanish and Polish. Playing with materials such as water can be an important outdoor experience for preschoolers. When children play with water, they can build fine- and gross-motor skills. They can also apply some basic principles of science and engineering. Also in Spanish and Polish. This article from the Blind Children’s Resource Center suggests creative and safe use of everyday objects to encourage a child with disabilities to play. Age-Appropriate Play for Young Children? Children and play go together. For most people who work with young children, play has a central place in childhood. This FAQ introduces some aspects of play and lists resources for readers who want to explore the topic further. Also in Spanish. Stores today are full of toys with “eye appeal” for children and adults. This can make it hard to tell if a toy is worth buying. After all, a child can turn almost anything into a toy! Here are some questions to keep in mind when you make decisions about toys for children. Also in Spanish and Polish. It has been said that play is children’s work. Children work hard at their play because they can make it up themselves. The best part about children’s play is that they learn a great deal while having fun. Here are some things to keep in mind about play. Also in Spanish, Polish, and Korean.